Strangely, Heinrich Himmler also committed suicide while in Allied custody. This saved the Allies the trouble of putting these men on trial at the Nuremberg International Military Tribunal. However, the Gerstein Report, written in French, was entered into the IMT as evidence of Nazi war crimes. 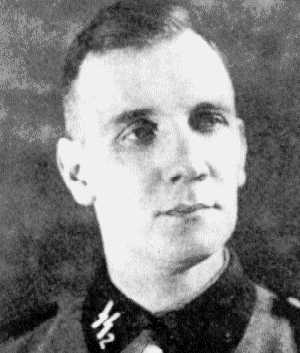 I mentioned Kurt Gerstein very briefly in a previous post about Belzec, one of the Nazi “extermination camps” where Gerstein claimed to have witnessed the gassing of the Jews. Some Holocaust deniers claim that the Gerstein Report is a forgery. I am suspicious of his report myself. Why did he write it in French, when his native language was German? Oh, wait a minute — he was in French custody at the time, so of course, he wrote it in French. Gerstein was responsible for delivering Zyklon-B to the camps because he was “a member of the Institute for Hygiene of the Waffen-SS” according to Wikipedia. Gerstein was a highly educated man — why didn’t he know that Zyklon-B was being used to disinfect clothing to prevent typhus? Why would he think that the Jews were being sent to some God-forsaken place to be killed with lice poison? Allegedly, the Nazis used Carbon Dioxide to kill the Jews at Belzec. He must have known that the Zyklon-B was being used for disinfection. Because of his position in the Hygiene Institute and his expert knowledge of decontamination techniques, Gerstein was called upon to assist in the implementation of the “Final Solution.” He was responsible for the delivery of large quantities of Zyklon B to Auschwitz and other camps. He also was invited to inspect the Aktion Reinhard killing center at Belzec, where the SS staff used carbon monoxide gas in the gas chambers to murder prisoners. On this occasion, in August 1942, he observed a mass killing of Jews at Belzec. In his postwar confession, Gerstein recorded what he saw at Belzec in great detail. He described the process by which trainloads of Jews entered the camp; their possessions were taken and their hair shorn. They were made to undress and crowd into a chamber (designed to look like a shower-room) so tightly they could not fall as they suffocated. Gerstein took no satisfaction in this process. He later maintained to friends that this experience made him determined to inform the world of the horrors taking place in the killing centers. He also claimed to friends during the war that he had, on at least one occasion, failed to deliver a shipment of Zyklon B gas and instead disposed of it. Among the contacts Gerstein hoped would spread word of what he had witnessed were Swedish diplomat Baron von Otter, the papal nuncio in Berlin (Father Cesare Orsenigo), numerous members of the Confessing and Lutheran churches, and opponents of the Nazi regime. As he told those who would listen, he dreamed that the Allies would drop pamphlets across Germany; the pamphlets would inform people about what was really happening and thereby prompt the public to demand that the murder cease. Despite Gerstein’s efforts, those dreams never became reality. By April 1945, the destruction of the Third Reich was imminent. Gerstein turned himself in to French authorities in the town of Reutlingen. In his statement, he declared that he had surrendered to make available his knowledge to punish those responsible for the atrocities. Ironically, however, Gerstein became not a witness but a suspect. At the end of May 1945, he was moved from a hotel where he had been staying under semi-house arrest to the jail in Konstanz and later to Cherche-Midi Prison in Paris. In Paris, he drafted his final statement, now known as the Gerstein Report. In this report, he recounted all that he had seen during his service with the SS. 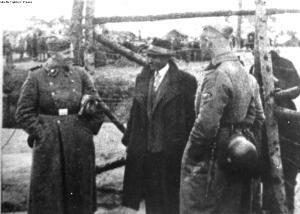 It was here he described his experience at Belzec and his conversations with von Otter and other foreign officials. In his statement, Gerstein sought to deflect suspicion from himself as a Nazi offender. Whether it was the nature of the accusations against him, the profound distress of failing to slow the implementation of the “Final Solution,” or his fear of being convicted for his SS role, Gerstein hanged himself in July 1945. The photo above, which was taken at the Belzec extermination camp, shows women who have been selected to sort the clothing, taken from the prisoners at Belzec. The clothing was sent back to Germany, along with the lice, because the Zyklon-B that Kurt Gerstein delivered to the camp was used to murder the Jews, not to kill the lice, according to the Holocaust True Believers. 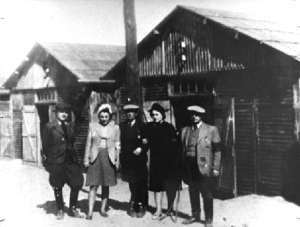 This website http://www.aish.com/jw/s/Belzec-The-Forgotten-Camp.html claims that ONE MILLION Jews were killed in only 9 months at Belzec, which was staffed by only 12 SS men.